Yesterday there was an earthquake in northeastern Australia. Here is the USGS website for this M 5.7 earthquake. This earthquake occurred in a region that also experienced a similar magnitude earthquake in 2011. Here is the USGS website for that M 5.0 earthquake. 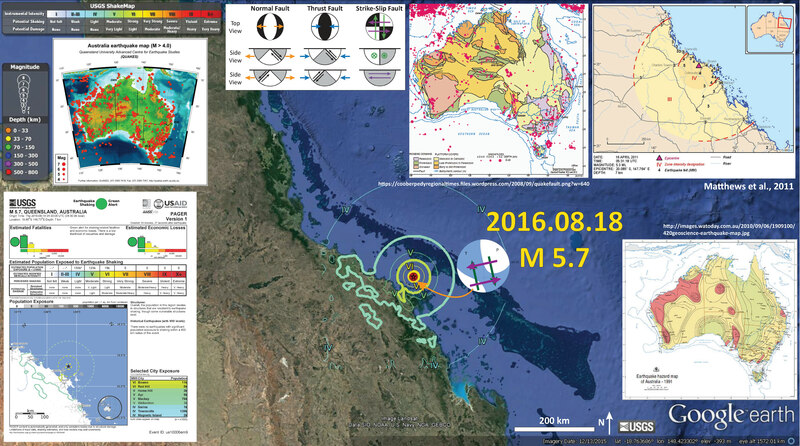 More can be found about the larger earthquakes that have occurred in Australia here. Here is my interpretive map that shows the epicenter, along with the shaking intensity contours. These contours use the Modified Mercalli Intensity (MMI) scale. The MMI is a qualitative measure of shaking intensity. More on the MMI scale can be found here and here. This is based upon a computer model estimate of ground motions, different from the “Did You Feel It?” estimate of ground motions that is actually based on real observations. I placed a moment tensor / focal mechanism legend on the poster. There is more material from the USGS web sites about moment tensors and focal mechanisms (the beach ball symbols). Both moment tensors and focal mechanisms are solutions to seismologic data that reveal two possible interpretations for fault orientation and sense of motion. One must use other information, like the regional tectonics, to interpret which of the two possibilities is more likely. There are some faults in the region that are northeast striking, so this slightly favors an interpretation of a right-lateral (dextral) strike-slip earthquake. I include some inset figures and maps. In the upper right corner is a figure from Matthews et al. (2011) showing the felt region from the 2011.04.16 earthquake near Bowen, AU. To the left of that is a figure that shows the geology, faults, and seismicity in Australia. This map is from Australian Government Geoscience Australia (AGSO). In the lower right corner is a map of the seismic hazard in Australia from 1991 (so it is dated). There is an updated version of this map here, with an online interface here. However, this region of AU still has a low seismic hazard. In the lower left corner is the Rapid Assessment of an Earthquake’s Impact (PAGER) report. More on the PAGER program can be found here. An explanation of a PAGER report can be found here. PAGER reports are modeled estimates of damage. On the top is a histogram showing estimated casualties and on the right is an estimate of possible economic losses. 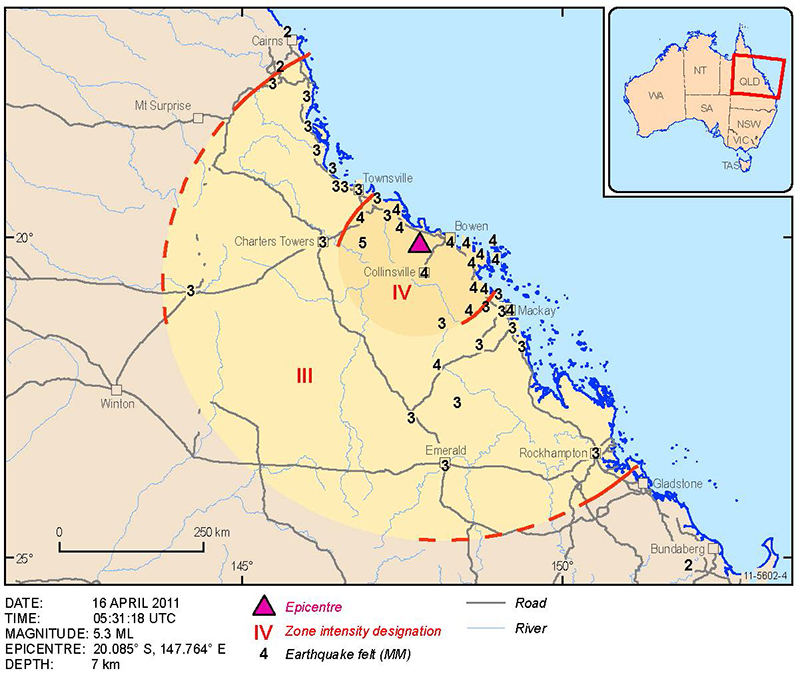 In the upper left corner is a plot of seismicity from the Queensland University Advanced Centre for Earthquake Studies (QUAKES). Here is more on the 2011.04.16 M 5.0 Earthquake. First the figure and then below is a description from AGSO in blockquote. 2 Responses to Earthquake Report: Australia!